This is where I am right now: it has been quite a week. Actually, to be perfectly honest, and for lack of a better way to put it, it’s been a pretty terrible week. It could have been a worse week, and for that I’m thankful – that it wasn’t worse – but, it has still been the sort of week where, at the end of it, you need a really effing huge (and I almost never use fake expletives, so you better believe I mean this) glass of wine to salvage any vestiges of sanity and good humor you may have hiding somewhere. The week before was a rough week, but it was merely busy. It was just work. I can handle work stress with a tearful breakdown only every couple of weeks (crying is how I seem to let emotions out. Any emotion. Happy, sad, angry, stressed…It’s not convenient, but it’s how I work.). But this week it got personal as well. Squid, our darling sweet little puppy, one of the things that is truly right at the center of our worlds right now, was almost killed. Twice. Give me 8 hour meetings and working until midnight over that any day. She’s fine now, thank heaven. But in each moment, it was terrifying. The first was at the beginning of the week. I was just finishing a vigorous walk with the Squiddles before I had to go in for a long meeting. We ran into a bouncy 1 1/2 year old golden retriever who wanted to play. Squid loves pretty much every dog and person she meets, greeting them with her own whirl of joyful effusiveness, so they immediately started tousling. In a blink, too fast to quite see what happened, the retriever’s leash somehow tangled itself tightly around Squid’s neck. At first Squid yelped frantically in pain, then the yelping stopped as the leash pulled tighter and tighter and she couldn’t breath. I full-on tackled the retriever. It was one of those do whatever it takes moments. I leapt on it and pinned it down and unhooked its leash. Immediately the loop around Squid’s neck loosened, and as I unwound it she laid down and just panted for about 20 minutes. It wasn’t anybody’s fault, something I assured the retriever’s owner of repeatedly. It’s the sort of thing you could never anticipate. It hasn’t happened before. I hope it doesn’t happen again. I was totally calm and reasonable while we were still at the park. But, the moment we got home and I set Squid down on her bed, I called Joel and had a complete melt down. I was a puddle of dripping nerves. The image of her terrified eyes and the sound of her yelping refused to be shaken from my head. We had a couple days to calm down from that incident, and then came the next. I can’t help but blame us for this one, even though, again, who would have anticipated it? We were away for an hour in the evening, and we had left the apartment in puppy-proof mode. But Squid, we now know, may be part monkey. As small as she is, she managed to reach the top of a bureau and knock down a bag that was up there (she also somehow got one of my scarves out of a closed drawer). She must have opened the bag and emptied its contents and then found and ate her way through a bottle of medicine that was in there. When we came home what we saw first was vomit everywhere. Instead of her usual happy tail wagging, Squid cowered when we walked in the door, even though we showed no signs of anger, only surprise. She slunk into her crate, looking like misery itself. She must have been feeling truly awful. We grabbed her and sprinted to the car. The 8 minutes to the animal hospital (I am so thankful it is so nearby) felt like an eternity, sitting with the shivering, whimpering puppy in my lap as Joel sped the whole way. We sat in the hospital for several hours while Squid was back in the ER. The powerlessness of the moment is what haunts me with this one. In the end we went home and tried to sleep while they kept her there to monitor her through the critical period. If she made it to 5 am without her central nervous system shutting down, then she was going to be completely fine. I was elated when the vet’s voice was chipper over the phone the next morning. Squid was up and doing well, and I could come bring her home. She slept and still looked quite under the weather all day yesterday. But finally, last night at 8:30 she decided she would eat something. Then she wanted to play a little tug with her bunny rabbit toy. Her tail lifted back to its normal, perky height. This morning we woke up and found that our energetic little angel-devil-troublemaker was back and right as rain. She’s hardly worse for the wear. It’s a remarkable trait of puppies, the way they bounce back. They don’t dwell on things, something I could stand to learn from Squid. I’m obsessed with what I could have done, feeling terrible that I wasn’t able to prevent the pain that she went through, wishing I could protect her and her innocent happy-go-lucky doofiness from the fact that there are things in the world that are dangerous. I wish I could explain, so that she could learn. But at the same time, it’s her blessing that she doesn’t see the world that way. I’m the one who looks at the world through a lens of fear and distrust, and perhaps I’m just using these incidents to confirm my addiction to fear. To justify the way I sometimes behave like the hedgehog and curl up into a bundle of protective bristles, trying to defend against the fact that the world is full of pain and sadness, defenses so raised that I can’t let in pleasure and joy either in those moments. Squid could, it must be admitted, learn to have a little more caution. But, as I said, I could stand to learn to dwell a little less. So this is where I am right now. A little worn out, a massive painful knot still hanging out under one of my shoulder blades, looking to release, craving things that are comfortable. Which is why I made fries. I don’t actually even like fries, but I really wanted a vehicle for ketchup. So, I dug in the crisper drawer and produced a couple of kohlrabi, which I made into baked kohlrabi fries, and they hit the spot. Kohlrabi (which in German means “cabbage-turnip”) is a member of the same family as cabbage, broccoli, cauliflower, and friends. Being a brassica, it is swollen with vitamins and all sorts of beneficial phytochemicals, which means you are perfectly welcome to think of these as “health fries.” I’m planning to. As you cut the roots into wands, a light broccoli smell will waft up and tickle your nose. A stemmy broccoli flavor is there too, though it’s substantially sweetened and softened by the roasting process. You could flavor these just with sea-salt, but I also flavored mine with a generous helping of chili powder and a bit of ground cumin. They can stand up to wads of spice. And though I mainly wanted ketchup, I also made a little bowl of cilanto-lime yogurt. You know, “health sauce” for my “health fries.” I just ate the whole pile myself. And now, Squid and I are going to go cuddle on the couch. Preheat your oven to 425F. 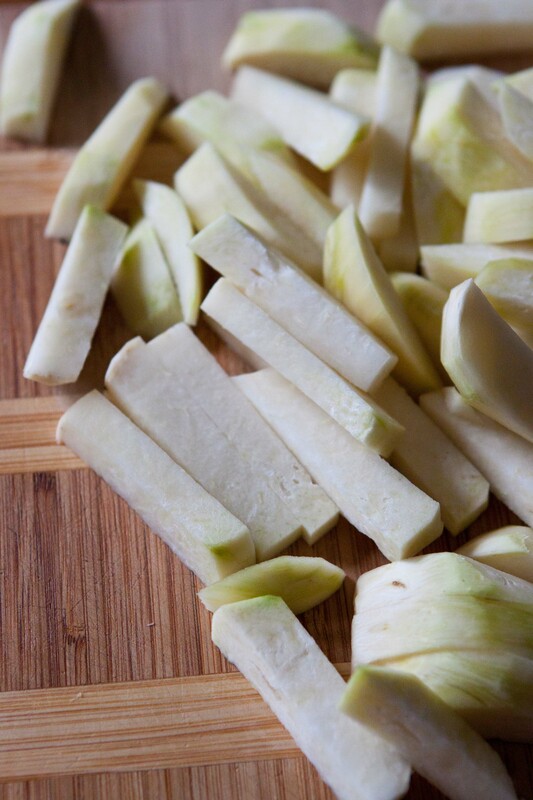 Wash the kohlrabi, then use a sharp paring knife or good vegetable peeler to peel them. Cut them into matchsticks. 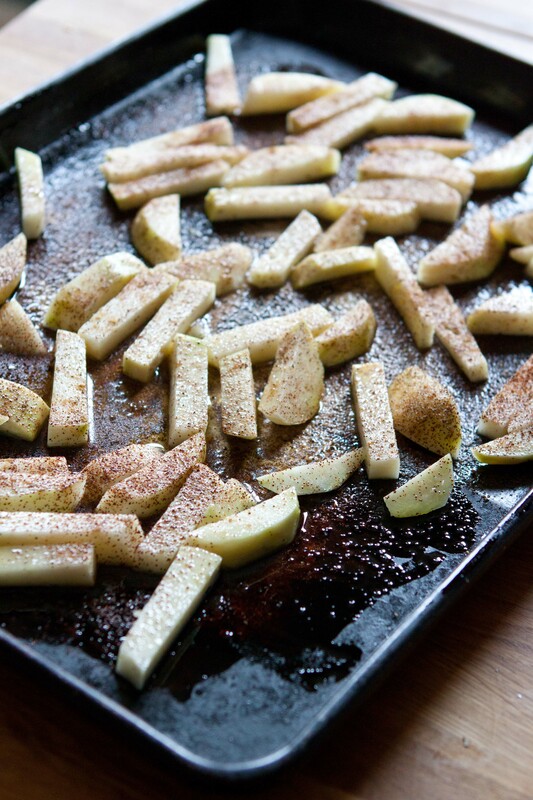 On a large rimmed baking sheet, toss the kohlrabi sticks with the oil and sprinkle very generously with salt and chili powder, and sprinkle on a smaller amount of cumin. Spread the kohlrabi in a single layer. Bake in the oven, flipping once, until they are soft and getting blistered and dark on the outside, about 30 minutes. 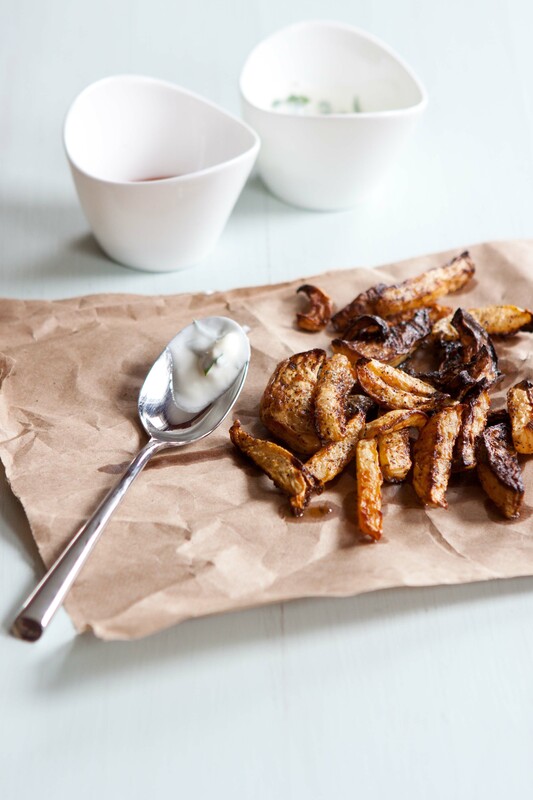 Remove and eat warm with ketchup or with yogurt dipping sauce (see below). Stir all ingredients together. It’s that simple! Oh, Em! Even though I knew you’d been through the puppy parent ringer, I have a vicarious knot in my stomach from reading your post. So glad little Squid is okay! PS: I had kohlrabi in my CSA box this past week and made an Indian fish curry (which was lovely) but the next time I have them I’m making your fries. Thanks so much Jenny. We have, indeed, been through the ringer this week, but I think we all learned a lot, and, as they say, all’s well that end’s well! We’re so happy Squid is okay too, of course. Also, I love the sound of a kohlrabi and fish curry, yum! I’m so glad that your puppy is okay. My boyfriend and I adopted an old cat a year and a half ago, and we’ve had a couple of bad health scares with her that had me in tears. I can’t imagine having 2 terrible accidents with a puppy in such a short time. But she’s back and at ’em! Yay! I made a Chinese-style slaw with kohlrabi last year and it was a hit. Now I’m anxious to see kohlrabi at the farmer’s market again so I can try these fries! Chili powder and cumin make so many things better. Thank you! And sorry to hear you’ve had scares with your cat too! But, it sounds like she came out fine as well. Crazy how much we just dote on our pets, isn’t it? Or maybe it’s actually one of the more sane things we do… Also, I LOVE kohlrabi slaw! Yum. I’m going to make that next. Thanks for making me think about it. Holy cow, what a week! I am glad you are all well. Your story should be forwarded to Garrison Keillor. It could be a skit for the Ketchup Advisory Board on a Prairie Home Companion! As for the fries, they sound really good! The cilantro-lime yogurt sauce sounds great too. Thank you! You should see her today! She went playing in the dog park, and she looked as healthy as ever. Phew! A bad week for sure! It was, but we’re all doing great now. That’s so scary! I’m happy your little Squid is OK and getting some cuddles. I’ve never held my breathe through an entire post (until now) I’m glad your pup is okay. It’s always scary when something happens to them (I had to punt another dog before because he was attacking my dog- worst feeling in the world.) So glad that everything is good. 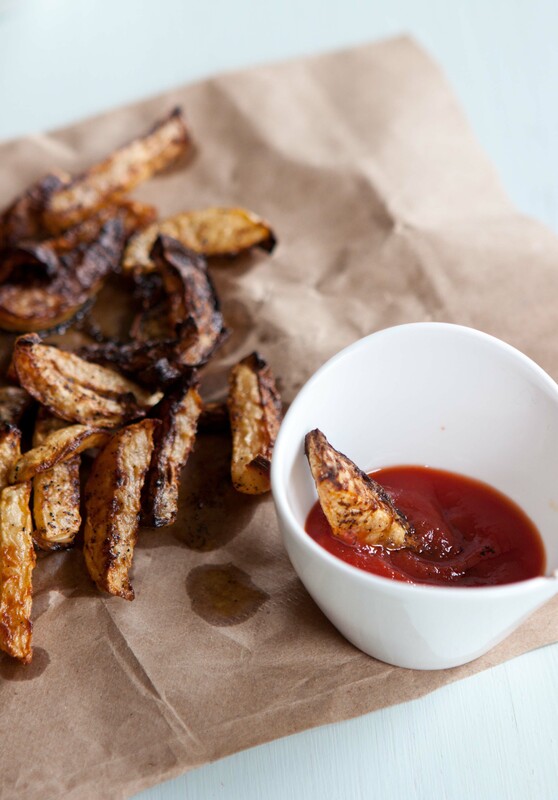 These fries look amazing and now when I get kohlrabi, I will know exactly what to do! Hope you have a wonderful weekend after a not-so-great week! Thank you so much. I’m sorry to hear about your incident with your dog, but way to go you! You discover in those moments that you’d do just about anything for them, don’t you! We’re hoping to have a very relaxing weekend, and I hope you do too!!! French fries and ice cream are my two ultimate comfort foods. Unless I’m sick, the it’s homemade chicken and vegetable soup or knoephla soup. Oh wow! Congrats on your little darling! Joel grew up with a sheltie :). I’m sure you’ll be amazing puppy parents! Enjoy the time because even though it’s a ton of work, they’re SO sweet, and boy do they start growing up fast (I know that’s something you hear all the time, and you just don’t know quite how true it is until it’s your own puppy (or child, I’m sure), suddenly seeming to double in size). Yes, she loves to be picked up, and she’s leggy enough to be big for a sheltie, so I’m sure the day will come when she’s too big to pick up easily (although my boyfriend still picks up his parents’ older sheltie, and she’s about 9 years old and 30 pounds. We’re actually sort of excited for her to be out of the puppy phase as we like to go hiking and would love to bring her along. Right now she’s only just starting to be leash trained and she eats everything she can on the ground. Lol. But yes, I will miss the fuzzy little cuddlebug who can sleep most of the day. I can’t imagine how hard that must have been – so glad Squid is okay. 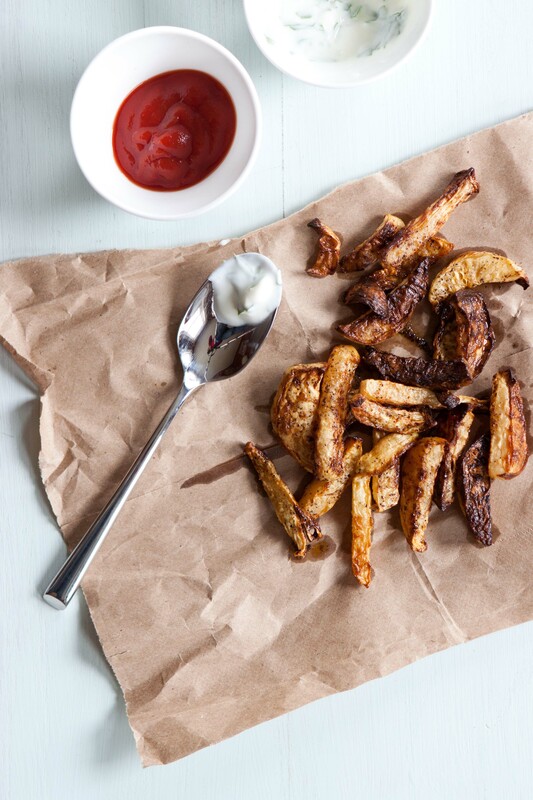 And thanks for the post – we’ve been wanting to play with kohlrabi for a while now, and these fries look amazing. Thanks so much Jen. 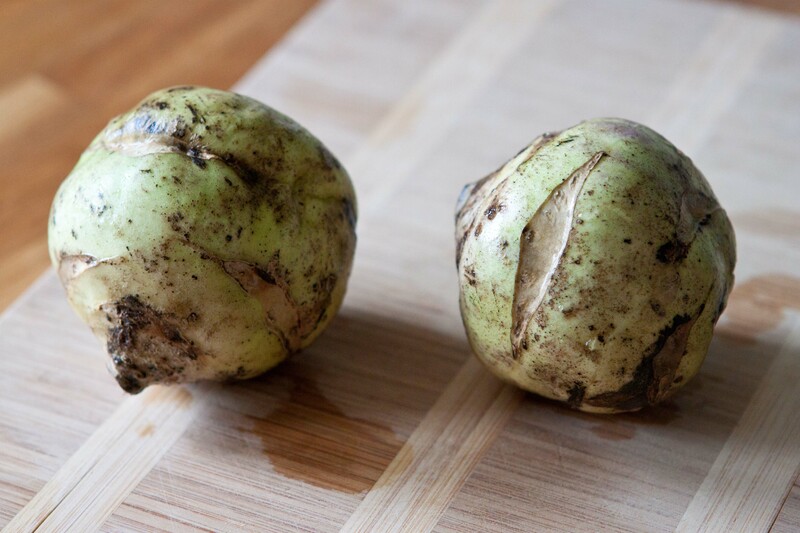 And, have fun playing with kohlrabi! It’s a great vegetable. Oh my word! You all deserve a lovely relaxing weekend after all that! I hope all is okay and best of luck with Squid-proofing the house 🙂 Oh, and great recipe! oh you make me hate myself… Cuz i will never be able to make these! I love kohlrabi but unfortunately it is not very common in Calgary. That’s too bad! I’ll keep my fingers crossed for you that you come across some during the season! I’m so sorry to hear all you’ve been going through – 2 scares in 1 week…way too much. I’m happy Squid is ok and hoping that this next week is calm and peaceful for you. I’ve never actually cooked kohlrabi before, although I love the brassica family. This may be the recipe to get me going! Thanks so much Hannah. It was pretty intense, but we’re doing well now! I hope you give kohlrabi a try. I bet you’ll love it! I was totally just looking for a kohlrabi oven fries recipe and I came across your blog. First of all- I’m sure it will be a great addition to tonight’s dinner. Secondly- OMG!!! I hardly ever read the story part of food blogs and just skim down to the recipe; after I read Squid’s story I had to run to the next room to repeat it all in detail for my husband. Props on being brave, thinking fast and tackling a stranger’s dog! Thank you! All’s well that ends well, I suppose! I just want to let you know that I made these tonight and absolutely love them! I have so much kohlrabi from my garden so I can see these fries happening a lot more 🙂 Thanks for the recipe! 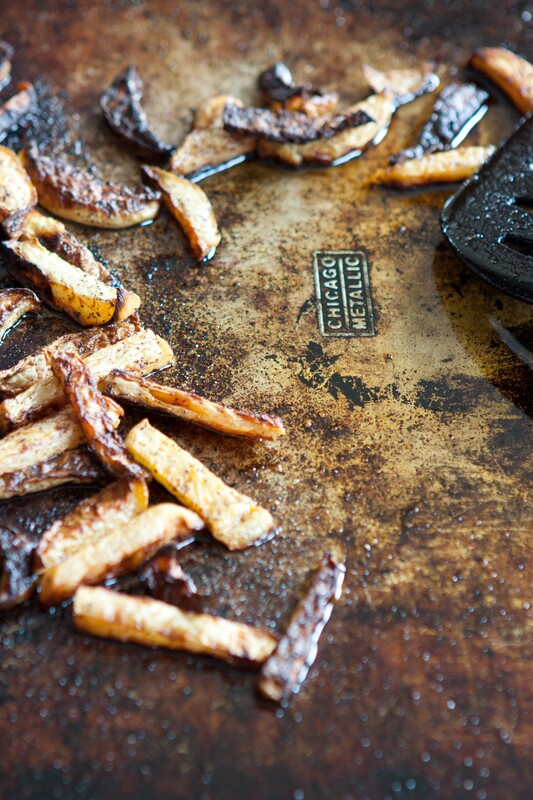 You are currently reading Chili-dusted kohlrabi fries at Five And Spice.